This is why the three major SaaS upstarts, namely Workday, Netsuite and SFDC, command up to 40 times their annual sales income in valuation; they threaten the status quo of a much, much larger industry scared stiff of being blown out of the water by disruptive technology that isn’t so dependent on armies of integration bodies to keep the software functional across the enterprise. And if they can genuinely figure out how to knit together multiple clouds within enterprise clients to create broader suites of enterprise SaaS, then these threat levels to the ERP status quo will rise significantly. However, with a quarter-of-a-trillion dollars a year being plowed into integrating and managing SAP and Oracle, are the SaaS upstarts truly ready to integrate multiple cloud apps at this gargantuan level of scale to challenge the status quo? Quite frankly, it seems light years away at this juncture and needs many, many more clouds to come together, supported by immense ongoing integration investment, to truly challenge with worldclass ERP. 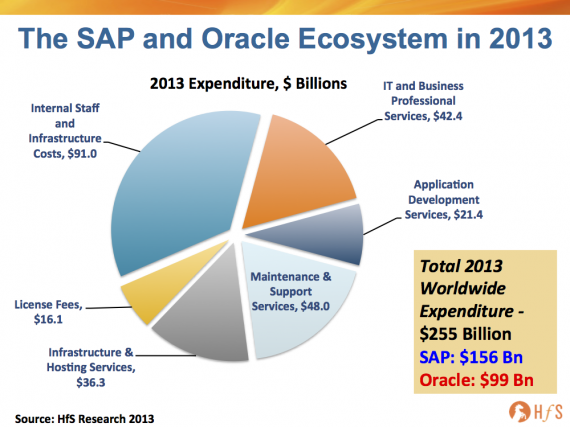 Is the gap between the SaaS "Big Three" and SAP and Oracle closing or widening? Both SAP and Oracle have made a number of SaaS acquisitions; they have updated their database and middleware offerings to be more cloud-friendly, Oracle reengineering its de facto industry standard enterprise database to run in clouds – Oracle Database 12c and it's brand new "In-memory" database (unveiled yesterday) that threatens to move data automatically between three tiers: disk, flash and dynamic random-access memory. Both vendors, to varying degrees, have come up with their own SaaS solutions, home engineered. Both vendors have far richer ecosystems and installed bases than Salesforce.com and Workday put together. SAP is approaching $1b in trailing four quarters cloud revenue, and once Oracle pushes 12c through its ecosystem and into several clouds, it will quickly ascend towards that benchmark number. NetSuite, was limited to companies under $300 million revenues for many years, and its financials still reflects this: very weak multi-currency, very weak consolidations, full support for only a few countries, etc. It works well for small-medium firms, but is unproven at the enterprise level. Workday, by contrast, is primarily designed for precisely those large-scale enterprises that NetSuite has previously avoided penetrating, and is determined to develop a financials system that would work for those companies. However, that is still seemingly many years from fruition, based on current progress. Saleforce.com is the industry-standard sales and CRM solution, but has yet to broaden into other core ERP areas namely HR and financials, and appears to be bent on doing this via co-development initiatives, such as this one, as opposed to buying up more SaaS modules to develop the elusive "enterprise cloud suite". The single-cloud app jig is up for Salesforce.com and Workday. The singular SaaS app play is a market that has begun its sunset, as the enterprise app suite monsters have not just caught on, but have turned the corner and are hurtling down the path to the cloud. To their credit, Mr. Benioff and Mr. Bhusri are joining forces now to be able to battle the rising SAP and Oracle funnel clouds over the coming years. It might not stop with Salesforce.com and Workday, who are likely, just as SAP and Oracle have done for on-premise suites down through the years, need to do many, many more acquisitions to round out their portfolio. Perception isn’t always reality. Having these major "true cloud" vendors form a partnership helps them promote a market perception that differentiates themselves from their on-premise (or pseudo-on-premise) competitors, but the practical benefits appear to be limited in today’s current environment. Sales-and-Work.com will likely become the third major ERP proposition over the long-haul. When we look out five years hence there will likely be 3, instead of 2, monster enterprise app providers, SAP, Oracle, and Sales-and-Work.com. But as the data plainly shows, the “deep integration” work never ends. Just ask the likes of Informatica, Accenture, Deloitte and IBM Global Services. Brave and accurate piece, with good facts and data to back up your argument. It's approaching the "go big or stay niche" time for many of the SaaS firms. Wow. One of the only balanced pieces on this market phenomenon I've seen Thanks for cutting through the hype and presenting reality. Wow, Phil. The SI's must be dancing in the aisles, laughing all the way to the bank. Before this article, I sensed that most were walking around saying " I speak cloud", while they were quaking in their boots. Sorry about the cliches. Insightful - never knew who much the SI's fed off the ERPs!